Looking back at 2016, it’s easy to see which health movement was the most popular throughout the year. According to search engine giant Google, the search interest for “vegan” spiked in 2015, increasing 32 percent from the previous year, a figure than can be attributed to the plethora of positive news stories about plant-based diets and the growing number of vegans. Encouragingly, this trend showed no signs of slowing down in 2016 however as Google Trends show an astonishing 90% increase in ‘vegan’ searches in last 12 months. 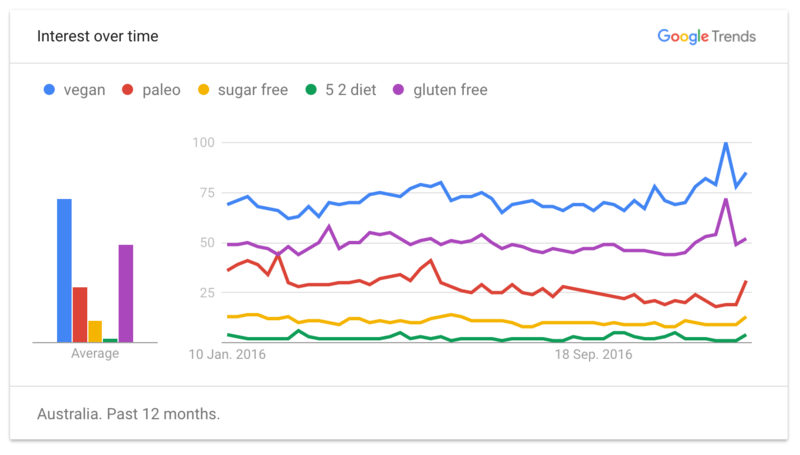 According to Google Trends data, when it comes to food and dietary trends, people in the UK are far more interested in vegan eating than they are about paleo, 5:2, vegetarian, or even sugar- or gluten-free diets. 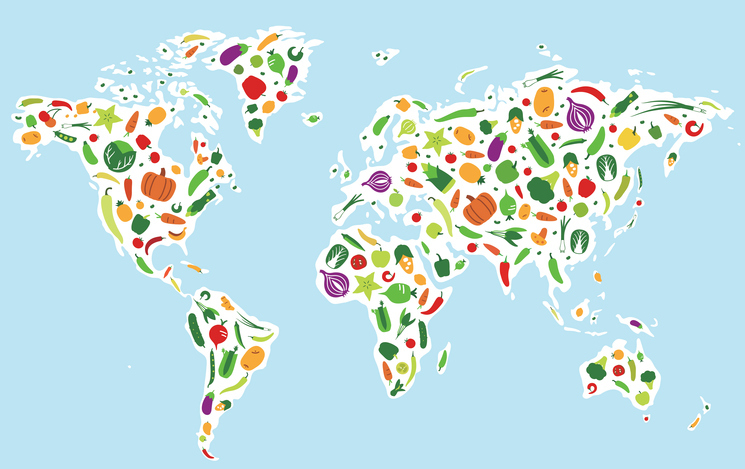 2016 saw veganism come to the forefront of mainstream media in the UK, with figures released from The Vegan Society suggesting there are now at least 542,000 people in Britain who are following a vegan diet, an increase of 350% compared to a decade ago. With more than half a million people in the UK now saying they follow a vegan or plant-based lifestyle, vegan food sales in the UK grew by a whopping 1,500 per cent in 2016. Evene supermarket giant Sainsbury’s got in on the act with the launch of their extensive range of vegan cheeses, which hit the headlines when they were renamed ‘Gary’, bringing yet more positive media attention to the vegan movement. Interest in vegan Easter eggs also reached the highest level of searches ever in the UK as consumers opted for cruelty-free alternatives for their egg hunts. The trend looks set to continue in 2017 with Veganuary kicking off with record numbers signing up to go vegan this January (50,000 and counting so far, which is double last year’s figures). Not only have record numbers already pledged to go vegan, Veganuary have also begun the process of decorating the London Underground with over 2,500 posters encouraging the city to go vegan. There are also poster campaigns from PETA and Go Vegan World which aim to make commuters stop and think about what’s on their plates. Like the UK, vegan is the number one health trend in the US, beating the likes of the paleo, 5:2 and gluten-free diet for the top spot. When it comes to dining out, New Yorker’s were keen to get their hands on delicious vegan fare, meaning “vegan food” was the top Google search term among New Yorkers in 2016. Not only are more people searching for “vegan food” online, they’re also buying it too. In fact, recent research found global sales of dairy-free alternatives are soaring. So much so in fact, that global sales are predicted to reach a staggering $21.7 billion in the next six years! 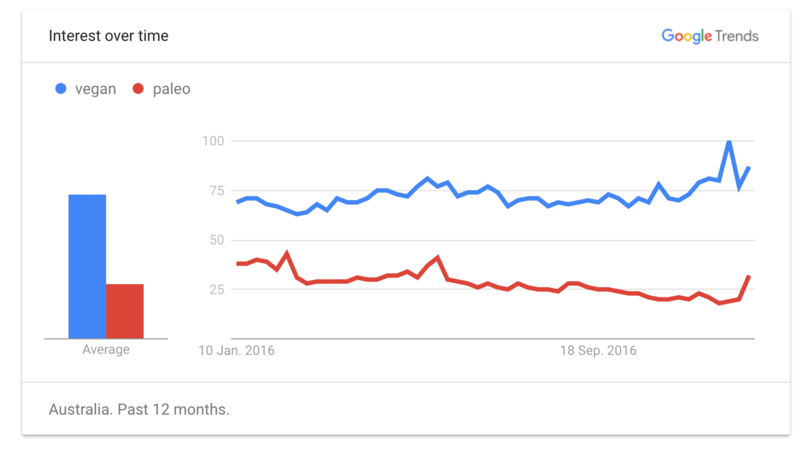 According to Google Trends data, Australians are more interested in getting information about vegan eating than they are about paleo, 5:2, vegetarian, or even sugar- or gluten-free diets. This comes as no surprise. PETA announced in April that Australians had the world’s biggest appetite for learning about vegan eating. This is fantastic news as it is estimated that around half a billion animals are killed every year in Australia by the meat, dairy, and egg industries. While “vegan” was by far the most searched-for food trend, “gluten-free” had the second-most Google searches, and “paleo” showed a yearlong decline, becoming more than 75 per cent less popular than “vegan”. This is a huge leap in the right direction as the paleo diet focuses on consuming large amounts of animal products. Sources: PETA Australia, Google Trends, Plant Based News.